While many homeowners care about saving money on energy bills and reducing their utility costs inside of their homes, not enough people focus on changes they can make outside. By following a few simple changes, you can make a significant improvement on reducing your energy bill outside of your home. If you have an HVAC system that heats and cools your home, you can adjust your thermostat to bring the temperature up and down to lower your heating and cooling bills. While you might think that the system alone will help you save, you also need to clean and clear your AC system regularly. The AC system is the larger unit that sits outside your home. Any debris, including tree branches, grocery store bags or even old leaves can change the way the system filters out air and leave you spending more money every month. Clear away debris from your AC unit at least once a month. 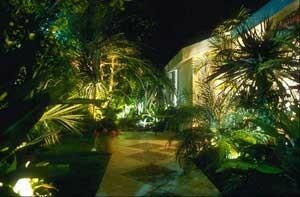 Any lighting you use on your lawn, patio or deck can increase your energy bills. One of the easiest ways to save money is with efficient lighting. Solar lights feature rechargeable batteries inside and use the heat and rays of the sun to charge those batteries during the day and to provide you with adequate lighting at night. Other outdoor lighting fixtures have an Energy Star rating and use less electricity. Using timers is another great way to save on outdoor energy costs. Hooking your sprinkler system up to a timer lets you decide when you want to water your lawn and garden. This can help you save on your water bills too. Timers are also suitable for use with holiday lighting and security lighting you use outside too. The cost of owning a pool may be higher than you expect because you need to heat and clean the water regularly. Using a pool cover cuts down on your costs and saves you some time too. That cover will keep the water at a warmer temperature as the heat from the sun beats down on the water, but the cover will also keep debris like leaves and branches out too. Using a few simple tips outside can help you save significantly on your energy bills. For more information or for details on insulation, contact USI online to find a branch near you and get a free quote. USI believes in excellence in every step of the process and ensures timely completion and quality of service, time after time.